Well, we only have four days to go before the festivities begin. We are so excited to bring Vancouver Island ukesters another fantastic festival full of fun, frivolity and ukulele fever this coming weekend at the Nanaimo Ukulele Festival. Bringing you Cynthia Kinnunen from Guelph, Ontario, a highly skilled and masterful teacher of the ukulele. There are still a few spots open in her Ookestra workshop so it’s not to late to join in on a fantastic and fun festival experience. Words from one of Cynthia’s students: “Right from the first lesson, Cynthia taught me a lot, from strumming techniques, to tricks of the instrument. 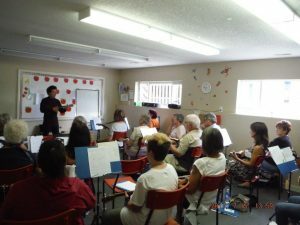 Cynthia is a fantastic teacher, and she brings such a passion for music to her teaching. When she plays, you can tell that Cynthia loves what she does, and that is crucial in a teacher. If you’re young and just starting out in the music world, or if you have a few years in your sails and want to bring a little uke into your life, I recommend contacting Cynthia. I can’t wait until my next lesson!” – Emma B.
I can hardly wait to experience the musical talent and ability of the boys in the Naked Waiters group. 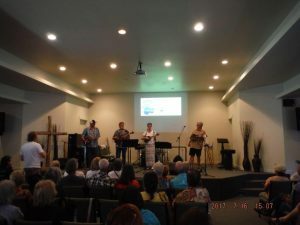 They characterize themselves with their “impressive ukulele playing, nice hair and handsome harmonies that set the mood for any event.” The “Waiters” are also gaining an impressive resume of bookings at international ukulele festivals. Don’t wait too long to pick up your concert tickets for the Saturday evening performance. 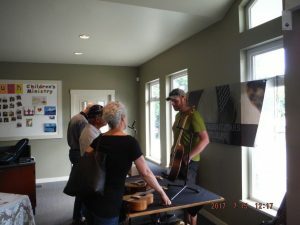 Parksville’s own Revolving Doors along with Mira and Katelynn and local open mic performers will bring local ukulele spirit to finish off the Festival on Sunday afternoon. Lets fill the Neighbourhood Church with great music and a rousing jamboree of ukulele playing and singing like the world is watching. Come on down for a whole lot of fun. Come even if you don’t play the ukulele (yet). Hope to see you all there. Bring a friend. D’Addario, one of our Festival supporters, has some fun info on their website that might help you find your ukulele personality and propel you off in a surprising direction in your ukulele playing journey. Click on the image below to find out your ukulele playing personality. 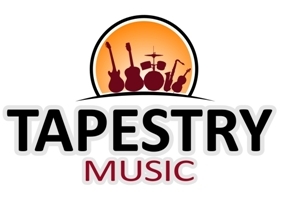 We are very happy to welcome Tapestry Music of Victoria, Vancouver and White Rock to the Nanaimo Ukulele Festival list of sponsors for the 2018 festival. Michael has generously donated an Acadia All Solid Mahogany Concert Ukulele valued at $199 which we will be giving away to a lucky winner during the festival. 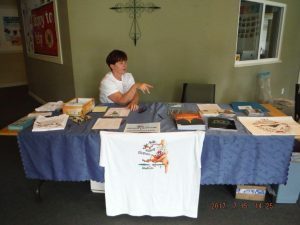 Tapestry Music will also have a vendor table at the festival on Saturday and Sunday. Make sure to stop by and chat with Michael and David. We did have a few items left behind at the festival last weekend. If you are missing a possession, please contact us and we will try to get it back to you. 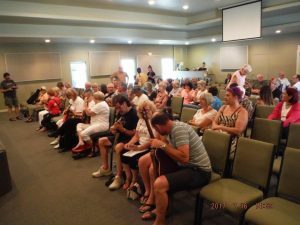 Pics of the 2017 Nanaimo Ukulele Festival. Tuning up for the Jammin’ Jamboree sing and strum. Melissa at the Registration/Information table. 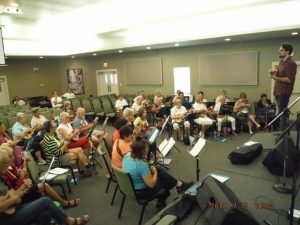 The Revolving Doors band performing at the Sunday afternoon Ukulele Jammin’ Jamboree. Steve Doreen, luthier, pleased with the interest his custom ukuleles are getting. Steve talks with interested ukulele players. James Hill in action teaching the Lyricism and Line workshop. 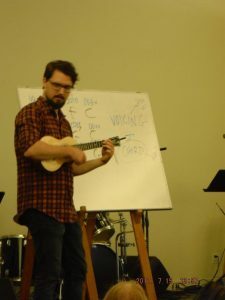 James teaches jazz chords in Swing Ukulele Swing workshop. Everyone has their own reason for wanting to play a musical instrument. But, why play the ukulele? Below is a list of my top 10 reasons that I choose to play the ukulele. It is easy to learn. I learned to play a song in a few minutes with just a few simple chords. I can take it on my trips and play it by the beach or up on a mountaintop. It makes me and people around me happy. I can play any kind of music on the uke…jazz, blues, pop, soul, country, oldies, or even Hawaiian! I have learned so much about music and music theory. The ukulele suits the size of my smaller hands so I can even play barre chords. The ukulele is affordable. I got started with a $40 ukulele that I bought at an outdoor market in Hawaii. I have met so many amazing and wonderful people at home and in places that I have travelled. Ukulele players are very friendly and fun loving people. There’s no right or wrong way to play an ukulele, there’s only your way. I’ve never met a grumpy ukulele player. I’d love to hear from you. What are your reasons for playing the uke?